Earthquakes are most deadly and expensive among the natural disasters affecting humankind. Exposure and vulnerability to the effects of earthquakes are increasing as the urban centres are growing, especially in tectonically active areas. According to a report published by the United Nations IDNDR-RADIUS Initiative Dhaka and Tehran are the cities with the highest relative earthquake disaster risk (Cardona et al., 1999). Dhaka mega city is overstressed due to its extremely high population, pressure on housing, transportation and other necessities for day to day life. As a result, infrastructural development and expansion have increased several folds over the last thirty years or so. Vulnerability due to earthquake and tsunami to the cities and built-environment still remains worldwide. The challenge to earthquake disaster mitigation is one of the most important tasks for the third world country. Vulnerability of Bangladesh is also significant and eastern and northeastern parts of Bangladesh are under threat of earthquake. 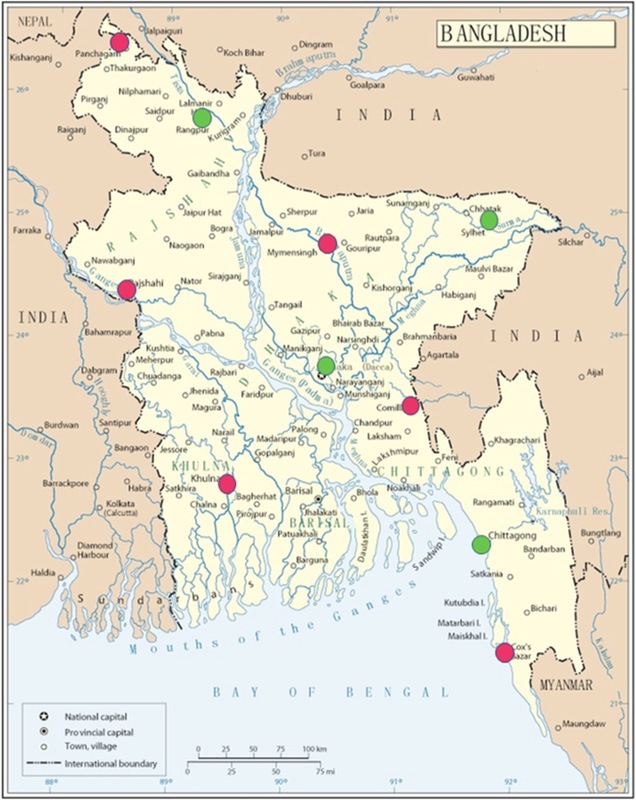 To support in this aspects Meteorological Department has been operating one seismic station located at Chittagong (since 1954) and three seismic stations at Dhaka, Rangpur and Sylhet since 2007. But the number stations are not sufficient for monitoring seismic activities. To understand the situation and to improve seismic activities in Bangladesh, 6 (six) more broadband seismic stations have been installed at Panchagarh, Mymensingh, Rajshahi, Khulna, Comilla and Cox’s Bazar by BMD using Government of Bangladesh (GoB) fund. But this is not sufficient to calculate the intensity of a earthquake. I would express my sincere thanks to the professionals and concerned persons for installation process and establish a network among all of the newly established seismic stations including the existing four stations. My heartfelt thanks are to the persons who have already conducted various studies especially on earthquake and risk assessment in Bangladesh.